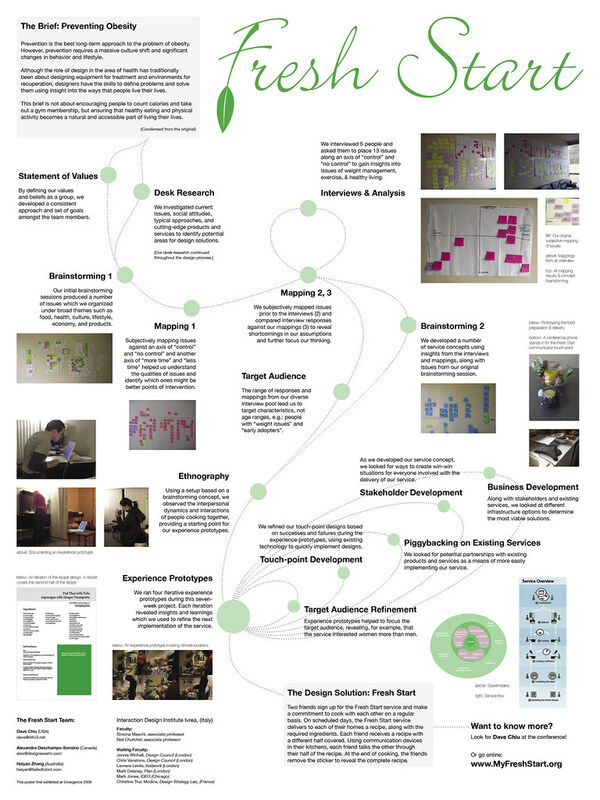 The poster I created in collaboration with Alexandra Deschamps-Sonsino for the Emergence 2006 service design conference to describe the Fresh Start design process. We explored the shared experience of cooking and based design decisions on user insights gained from multiple experience prototypes. Extensive documentation of Fresh Start is available at MyFreshStart.org. Experience prototypes While developing Fresh Start, we made extensive use of experience prototypes to gain insight into user behavior and discover opportunities for design solutions. Experience prototyping is a new design process methodology that enables prototyping of services and other intangible experiences. Successful experience prototypes typically prototype a service as if it existed and utilize user feedback to further refine the service experience. Project collateral In preparation for the Emergence 2006 Service Design conference, I created the MyFreshStart.org website, the Fresh Start poster exhibited at the conference, and the Fresh Start kiosk which supplemented the poster with videos of experience prototypes. I collaborated with Alexandra Deschamps-Sonsino on the design and layout of the website and poster.